The peeling of skin is a natural biological process whereby the skin cells renew themselves. Dead skin cells flake off while the new skin underneath forms the topmost layer. Usually, this process happens without us being conscious of the fact. However, when the rate of peeling becomes abnormally fast, it gives rise to disorders such as peeling fingertips. Skin has three layers: epidermis, dermis, and hypodermis. The epidermis is the outmost layer of skin and it is responsible for creating a waterproof barrier against germs and environmental factors. The dermis lies below the epidermis and contains hair follicles and sweat glands. It also contains tough connective tissue. The hypodermis is the innermost layer of skin, which is made of fat and connective tissue. Several factors can cause the skin on the fingertips to peel off. The most common cause is constant irritation or exposure to environmental elements—wind, sun, heat, dryness, or excessive humidity. Less common causes of peeling fingertips are allergic reactions, wherein the skin gets irritated by repeated contact with substances like fabrics, detergents, cosmetics, or latex. 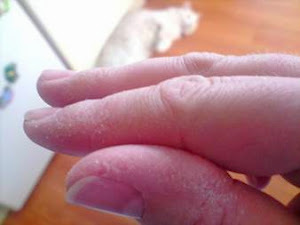 Food allergies can also cause peeling fingertips. Skin disorders such as psoriasis, atopic dermatitis, and seborrheic dermatitis may also lead to skin peeling. Staph infections and fungal infections such as athlete’s foot, jock itch, and ringworm also cause the skin to peel. Immune system disorders such as toxic shock syndrome and a group of rare skin disorders called pemphigus can also cause skin to peel. Even certain cancer types can lead to skin peeling. Adult non-Hodgkin’s lymphoma causes a skin rash giving rise to peeling of skin. Cutaneous T-cell lymphoma may also lead to peeling of fingertips. Certain medicines may cause side effects such as peeling of fingertips. Other disorders that may induce peeling of fingertips are diabetes, deficiency of vitamin B, frequent washing of hands, sunburn, conditions such as Kawasaki disease, erythroderma, scarlet fever, and ichthyosis. Rub some peeled and grated cucumber to the affected fingertips. Leave it on for 20 minutes and then wash off with water. Cucumber is primarily composed of water, thus it provides hydration and prevents further peeling of skin. It also soothes irritated and itchy skin. Fresh mint juice can be applied to the fingertips every night before going to bed. This is an effective treatment for peeling fingertips. Mint has the ability to cure skin disorders like eczema and dermatitis. It is also a natural moisturizer. As an added benefit, it is also very soothing and refreshing. Add a cup of rolled oats to a tub of warm water. Soak your hands in this mixture for about 10 minutes. Pat hands dry and cover them with a good quality hydrating lotion. This process can be repeated every day. A mixture of 1 tablespoon each of honey, sandalwood powder, and rosewater should be applied to the affected fingertips. This should be left on for 15-20 minutes. Wash your hands with tepid water and a mild cleanser. Massage your fingertips with olive oil every day after cleansing them. Alternatively, add olive oil to the water used to wash your hands. The omega-3-fatty acids present in olive oil nourish the skin and prevent it from peeling away. The use of aloe vera is very effective in treating peeling fingertips. Apply aloe vera gel to the fingertips every day and gently massage. You can also drink aloe vera juice instead for similar benefits. Aloe vera ensures that the skin stays hydrated, soft, and supple. Bananas can also work wonders to prevent peeling of fingertips. The potassium content of bananas helps maintain healthy and hydrated skin due to its role in maintaining the acid-base balance in the body. You can also apply a paste of mashed bananas and sour cream to the affected fingertips. This paste will moisturize the skin and help it heal faster. It should be applied every day for best results. Milk is a natural moisturizer and is beneficial in treating peeling fingertips. It also contains micronutrients that are required to maintain good skin. You can drink warm milk with added honey or nuts before bedtime for a good night’s sleep. You can also soak your hands in warm milk with honey to treat peeling skin. Massaging peeling fingertips with pure honey is also a good remedy to prevent further flaking. You can also apply a mixture of raw milk and honey to your fingertips. Honey is a humectant, which means that it absorbs moisture from the surroundings. It also contains several nutrients that are very useful for healthy skin. Eating nuts and foods containing “good” fats is essential for the maintenance of healthy skin. They help regulate oil production in the skin. They are also responsible for keeping skin hydrated and preventing it from drying and flaking. Eicosapentaenoic acid (EPA) is especially good for skin. Since they also have antioxidant properties, they protect skin from damage due to free radicals. These free radicals are generated when skin is exposed to the harmful ultraviolet rays of the sun. Nuts contain these omega-3-fatty acids that are necessary for supple and smooth skin. Foods cooked in olive oil, fish oil, and lean meats are also good for preventing peeling fingertips. In addition to these specific natural treatments that you can do at home, ensure that your diet contains adequate amounts of protein. Proteins are a major component of the skin and are necessary for repair and regeneration of skin. Incorporate exercise or some form of activity in your daily routine to keep the blood circulation going. Improved blood circulation helps remove toxins more easily from the body. Although it may not be possible to eliminate stress from our lives, we should strive to reduce it as much as we can. Stress can aggravate most disorders; it can also be the underlying cause of many diseases. Practicing yoga is an effective way to keep the body as well as the mind healthy. Alex George is a writer for RemoveSkinTags He loves to write on issues related to health and beauty. In his free time he loves to read spiritual books. For more information visit RemoveSkinTags or follow him on Twitter. Thank you for reading 10 Natural Treatments to Get Rid of Peeling Fingertips posted on the website Kwentology if you want to redistribute this article please include the link as the source. Have some kuwento to share? Contact us!